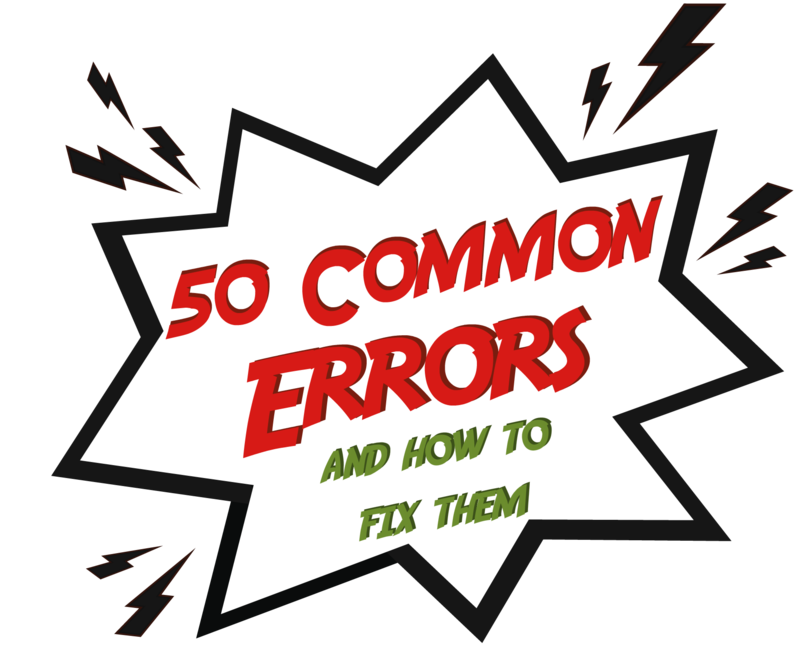 Here are 50 common errors that my college ESL students often get wrong in their writing and speaking. Mistakes are shown in context, with incorrect sentences, corrections, and a rule to explain how to avoid the usual mistakes that students make in their writing . In time, I will add links to online practice activities for each one. Until then, try the offline error correction card game below. Students enjoy it and learn a lot from playing this mildly competitive group activity. If you love errors and want more, I can recommend Professor Paul Brians’ collection of errors in university writing. For a shorter, more focused list of common errors, try here. Sometimes, context plays a role in determining if a phrase is used correctly. It all depends on how you use it. If you want a good example of a contextual error, a phrase in a correct sentence and the same phrase an incorrect sentence, have a look at my blog post on “Make no sense and have no sense.” You’ll see how challenging it is to detect common errors using a grammar checker. Of course, it is one thing to read a list of errors and another thing to make them stick in your memory. If you really want to remember how to correct mistakes and when the pressure is on, you should consider using an oral practice strategy. Sometimes, the best thing to do is to take a grammar course or an IELTS vocabulary course. Teachers have tricks to help learners avoid slip ups and mistakes. But the best way of all is to use an online grammar checker to check your writing for errors while you are exchanging meaningful messages with other people or writing essays for your teacher. INCORRECT: We sell t-shirts and some others clothes. CORRECT: We sell t-shirts and some other clothes. INCORRECT: When I heard the news, I was very anger. CORRECT: When I heard the news, I was very angry. RULE: Use the adjective form not the noun form in this context. INCORRECT: I trust more my parents than my friends. CORRECT: I trust my parents more than my friends. RULE: The adverb is in the wrong place. Do not separate more from than. INCORRECT: My sister has a children. CORRECT: My sister has a child. RULE: Don’t use indefinite articles with plural words. INCORRECT: I have a brown skin. CORRECT: I have brown skin. RULE: Don’t use an article with uncountable nouns like “skin”. INCORRECT: Every day, I am waking up late. CORRECT: Every day, I wake up late. RULE: Use the Present Simple, not the Present Progressive, for normal routines. INCORRECT: He is deserving to win the award. CORRECT: He deserves to win the award. RULE: Use the simple aspect form of “deserving” in this context. When expressing a fact, these stative verbs tend not to use the progressive aspect: agree, appear, believe, belong, concern, consist, contain, deny, depend, deserve, disagree, dislike, doubt, fit, hat, hear, imagine, impress, include, involve, know, like, love, matter, mean, mind, need, own, pleas, prefer, promise, realize, recognize, remember, see, seem, smell, sound, suppose, surprise, taste, think, understand, want, wish. INCORRECT: We don’t will have an exam next Tuesday. CORRECT: We won’t have an exam next Tuesday. RULE: You cannot negate a modal auxiliary in this way. Use “won’t” instead. INCORRECT: I work at Bordeaux jail as a prison guard. CORRECT: I work at Bordeaux Jail as a prison guard. RULE: Capitalize every lexical word in the name of an institution. Don’t capitalize prepositions and conjunctions. INCORRECT: I moved here to be closer from school. CORRECT: I moved here to be closer to school. RULE: The usual collocation for closer is to not from. INCORRECT: Success depends of you. CORRECT: Success depends on you. RULE: The usual collocation for depend is on not of. INCORRECT: If I learn a second language, finding a job will become more easy for me. CORRECT: If I learn a second language, finding a job will become easier for me. RULE: Remove the word “more” and simply write “easier.” English has two comparative adjective forms. Add -er to the end of one or two syllable adjectives. Use ‘more’ with longer adjectives. Here is a list of adjectives that usually take –er: big, black, bold, brave, bright, busy, clean, clear, clever, cold, cool, dark, dear, deep, dirty, dry, easy, fair, fast, fat, fine, funny, great, green, happy, hard, healthy, heavy, high, hot, kind, large, late, lazy, light, long, low, lucky, mad, merry, narrow, naughty, near, new, noisy, old, pale, poor, pretty, proud, quick, red, rich, sad, safe, shallow, sharp, short, slow, small, smooth, strong, sweet, tall, thick, thin, tiny, ugly, warm, wealthy, wet, white, wide, wild, wise, young, angry, little, short, blue, yellow, pink, orange, simple, shy. INCORRECT: So my job will be more easier for me if I am able to speak English as well as I can speak French. CORRECT: So my job will be easier for me if I am able to speak English as well as I can speak French. CORRECT: That’s who I am. RULE: Do not end a sentence with a pronoun + verb contraction. INCORRECT: I did’nt know the answer. CORRECT: I didn’t know the answer. INCORRECT: If I will get a better job, I will buy a car. CORRECT: If I get a better job, I will buy a car. CORRECT: Do not put ‘will’ in ‘If’ clauses. Use the Present Simple instead. INCORRECT: I made her cookies but she didn’t eat none. CORRECT: I made her cookies but she didn’t eat any. INCORRECT: In my opinion, video games don’t hurt nobody. CORRECT: In my opinion, video games don’t hurt anybody. INCORRECT: Me, I like to dance. CORRECT: I like to dance. INCORRECT: What I’m sure about it’s that I was the first one to arrive. CORRECT: What I’m sure about is that I was the first one to arrive. INCORRECT: In the future, we go on a trip to Africa. CORRECT: In the future, we will go on a trip to Africa. RULE: Don’t forget the auxiliary verb “will” for future events. You can, however, use the Simple Present for future scheduled events. Here is an example: My train leaves at 10:20. INCORRECT: I gonna be rich one day. CORRECT: I am going to be rich one day. RULE: The word gonna is slang. Make sure you develop full command of am/is/are going to for contexts where slang would be considered inappropriate. INCORRECT: When I will arrive, I will give you the money I owe you. CORRECT: When I arrive, I will give you the money I owe you. RULE: Do not use “will” in clauses that begin with as soon as, the moment, before, after, once, if, or when. These time clauses already have a future meaning. Use the Present Simple instead. INCORRECT: We talked about to go, but in the end decided to stay home. CORRECT: We talked about going, but in the end decided to stay home. RULE: You cannot use an infinitive form after a preposition. Use a gerund instead. INCORRECT: The first thing I do when I arrive is going to my locker to hang up my coat. CORRECT: The first thing I do when I arrive is go to my locker to hang up my coat. RULE: Use a bare infinitive not a gerund in this context. INCORRECT: He his my best friend. CORRECT: He is my best friend. RULE: An “h” was added to “is” by mistake. “His” is a possessive form. “Is” is a verb. INCORRECT: The New Democratic Party is increasing his popularity. CORRECT: The New Democratic Party is increasing its popularity. RULE: A political party is not a person. Use “its” for a non-person. INCORRECT: They jumped on the occasion. CORRECT: They jumped at the chance. RULE: This is a rather unnatural phrase in English. Try “jumped at the chance” instead. INCORRECT: This singer is very known. CORRECT: This singer is well-known. RULE: This is a rather unnatural phrase in English. INCORRECT: I would like to thanks all my friends for their help. CORRECT: I would like to thank all my friends for their help. RULE: Use the base form of the verb with “to”. INCORRECT: We were supposed to went early, but we woke up late. CORRECT: We were supposed to go early, but we woke up late. RULE: Use the base form of the verb with “to”. See more conjugations of “to go” here. INCORRECT: I very like ice cream. CORRECT: I really like ice cream. INCORRECT: We meeted at a restaurant. CORRECT: We met at a restaurant. RULE: Review irregular past tense verbs. You cannot add -ed to this verb. INCORRECT: Its hard to remember all these rules. CORRECT: It’s hard to remember all these rules. RULE: It’s is it plus the contracted form of the verb is, not a possessive form. Do not forget the apostrophe in the contraction. INCORRECT: Look at the dog chasing it’s tail. CORRECT: Look at the dog chasing its tail. RULE: Its is a possessive form, not a contraction. Do not use the apostrophe in the possessive form of pronouns. CORRECT: I am an accountant. RULE: Use an indefinite article before the name of a job or profession. INCORRECT: You making me crazy. CORRECT: You are making me crazy. RULE: You need an auxiliary (helping) verb to go with the –ing form. INCORRECT: I always be there for you. CORRECT: I will always be there for you. RULE: In a promise about the future, use the future modal auxiliary verb will with the infinitive form of your main verb. Virtual Writing Tutor plus Grammarly equals love. Get the free plugin. INCORRECT: I decided to put my swimsuit and go for a swim. CORRECT: I decided to put my swimsuit on and go for a swim. INCORRECT: I will like to have a better job. CORRECT: I would like to have a better job. RULE: Use would not will to express a desire for a different present. Use will to express a prediction. INCORRECT: I was not very enjoy telling the bad news. INCORRECT: I did not really enjoy telling the bad news. RULE: To negate a Past Simple tense verb use did not instead of was not. Use was/were not for adjectives and nouns instead. INCORRECT: We did not happy when she told us. CORRECT: We were not happy when she told us. RULE: Use was not or were not to negate adjectives and nouns. INCORRECT: I don’t have gone there before. CORRECT: I haven’t gone there before. RULE: Negate the Present Perfect by putting not or n’t after the auxiliary have or has. INCORRECT: In life, you have to accept the goods and the bads. CORRECT: In life, you have to accept the ups and downs. RULE: This is a non-standard phrase. The usual way to express this idea in English is to say ups and downs or pluses and minuses. CORRECT: My class is in the after noon. INCORRECT: My class is in the afternoon. INCORRECT: I have been living here since I am born. CORRECT: I have been living here since I was born. RULE: The phrase “since I am” means “because I am”. However, “since I was born” means “from the day that I was born”. INCORRECT: She has arrived yesterday. RULE: You cannot use the Present Perfect with a specific time in the past. Use the Past Simple instead. INCORRECT: I often wonder how many opportunities I would had had if I had finished university. CORRECT: I often wonder how many opportunities I would have had if I had finished university. RULE: There is a problem here with the perfect infinitive in this sentence. You cannot follow a modal with a past form. The correct form is modal + have + past participle. INCORRECT: It hurt my feeling. CORRECT: It hurt my feelings. RULE: When we talk about emotional pain, we use the word feeling with an -s on the end. It is never singular. However, if we want to talk about a sensation, we can can use feeling without an -s. For example, we say I have a strange feeling in my stomach. INCORRECT: I am wearing a short and a t-shirt. CORRECT: I am wearing shorts and a t-shirt. RULE: Some nouns are always plural. Here is a short list: shorts, jeans, pajamas, scissors, pliers, news, politics, sports. INCORRECT: The accident was no one fault. CORRECT: The accident was no one’s fault. RULE: When the fault belongs to no one, then a possessive form is needed. INCORRECT: My keys are in my coat’s pocket. CORRECT: My keys are in my coat pocket. OR My keys are in the pocket of my coat. RULE: You do not need a possessive form here. Use “coat” as a noun modifier instead. To talk about parts of non-living things, use the noun + noun structure or the of structure, like this: in the left pocket of my blue coat. INCORRECT: I live at Montreal. CORRECT: I live in Montreal. RULE: Use in for cities and towns. Use on for streets. Use at for a street address. LINK: See the visual guide to prepositions and try preposition practice activities here. INCORRECT: It’s been 5 years that I work here. CORRECT: I have worked here for 5 years. RULE: Use the Present Perfect for past events that include the present. INCORRECT: I am living here since 2012. CORRECT: I have lived here since 2012. INCORRECT: This article is about how people learn words and remember it. CORRECT: This article is about how people learn words and remember them. RULE: In this sentence, the singular pronoun it incorrectly refers to the plural antecedent words. Your pronoun should agree in number with its antecedent. Use them with a plural antecedent. INCORRECT: Education should be free . CORRECT: Education should be free. RULE: Do not put a space before a punctuation mark. Put the space after it. INCORRECT: How much people were there at the party? CORRECT: How many people were there at the party? RULE: Use much with singular or uncountable nouns and many with plural nouns. INCORRECT: Are you work here? CORRECT: Do you work here? RULE: Use a form of the auxiliary do with simple aspect verbs in questions. Use are for adjectives and nouns. INCORRECT: Did you are tired after work? CORRECT: Were you tired after work? RULE: Use a form of the auxiliary do with simple aspect verbs in questions. Use a form of be for adjectives and nouns. INCORRECT: She said, that I was wrong. CORRECT: She said that I was wrong. RULE: Do not put a comma before reported speech (also known as an indirect quotation). INCORRECT: I think practicing English with classmates is equally as effective. CORRECT: I think practicing English with classmates is as effective. RULE: Do not say equally as. Use either equally or as on its own. INCORRECT: The college has sent everyone an invite to the event. CORRECT: The college has sent everyone an invitation to the event. INCORRECT: Wich one do you want? CORRECT: Which one do you want? INCORRECT: I tought you liked that. CORRECT: I thought you liked that. INCORRECT: I like my program even tough it is difficult. CORRECT: I like my program even though it is difficult. INCORRECT: I live in Montréal, Québec. CORRECT: I live in Montreal, Quebec. RULE: Avoid using diacritics in English. They can appear (cliché, fiancé, resumé) but are never compulsory. INCORRECT: This is begining to make sense. CORRECT: This is beginning to make sense. RULE: Double a final single consonant before an –ing or –ed suffix when both of these conditions apply: (a) one vowel precedes the consonant; and (b1) it is a one-syllable word or (b2) a stressed syllable. RULE: Change the y to -ie before adding –s when preceded by a consonant. INCORRECT: One of my friends are driving. CORRECT: One of my friends is driving. RULE: Make sure your verb agrees with its subject. The noun phrase one of my friends is singular and therefore requires the singular form is not are. RULE: Do not shift from a past tense verb to a present tense arbitrarily in the same sentence. INCORRECT: I stayed with her for a while to be sure that she will be okay. CORRECT: I stayed with her for a while to be sure that she would be okay. RULE: Use would not will in a sentence describing past events. INCORRECT: There are less people applying to Liberal Arts programs these days. CORRECT: There are fewer people applying to Liberal Arts programs these days. RULE: Less is the comparative form of the adjective little. Use less with uncountable nouns like salt or time. Fewer is the comparative form of few. Use fewer with countable nouns like people and cars. INCORRECT: I was boring, so I thought it would be fun to go on a trip and visit the island. CORRECT: I was bored, so I thought it would be fun to go on a trip and visit the island. RULE: “Boring” is the wrong form of the verb “to bore” for this context. An easy way to remember the difference between “boring” and “bored” is anything that is “boring” is the cause of the boredom and anyone who is “bored” is affected by boredom. In this case you were affected by boredom. INCORRECT: My girlfriend has blonde straight long hair. CORRECT: My girlfriend has long straight blonde hair. INCORRECT: I am not enough good, and there is not time enough to practice. CORRECT: I am not good enough, and there is not enough time to practice. RULE: Put the word enough after adjectives but before nouns. INCORRECT: Everybody knows your crazy. CORRECT: Everybody knows you’re crazy. RULE: Your is a possessive word. You’re is the contracted form of you + are. When you want to link a pronoun to an adjective like crazy, use you’re not your. INCORRECT: Is that you’re coat? CORRECT: Is that your coat? RULE: When you want to indicate possession, use your. You’re is the contracted form of you + are. Read more about this excellent card game here: Error Correction Card game.